Original Equipment Manufacturer Versus Original Equipment Equivalent Windscreens (and Glass). This has emerged as a common question for many motorists and a growing number of consumers. The availability of information via the internet has raised awareness among the more discerning motorists about the distinction between aftermarket and genuine glass. Windscreens have become much more complex in the role they play in a vehicle. It is much more than what the name suggests, and with the advent of driver assistance technology, the relevance of windscreen authenticity and product quality has never been so pertinent. Whether the vehicle is new or leased, the consumer is usually told by the contracted repairer that the replacement windscreen they intend to fit will be an original equipment equivalent ( “OEE” ). However, when the fitter (or technician) shows up to replace the broken windscreen, the glass may not bear the (vehicle) manufacturer’s logo. For many years, this subject has been trivialised with what’s the big deal attitudes however, today the big question being asked – and rightly so – is, what is the difference? OEM – Original Equipment Manufacturer. Most commonly referred to as OE parts, are produced under license from the car manufacturer, and installed in the factory when the vehicle is assembled. These parts are also sold via the vehicle’s main dealer networks as replacement parts. OEE – Original Equipment Equivalent. These are parts produced for installation in the ‘aftermarket’ by third party companies. This option can also be referred to as aftermarket glass ( “AM” ). They can be produced by the same manufacturer as the OE version (but not always in the same factory using the exact same process). What is an OEM Windscreen? 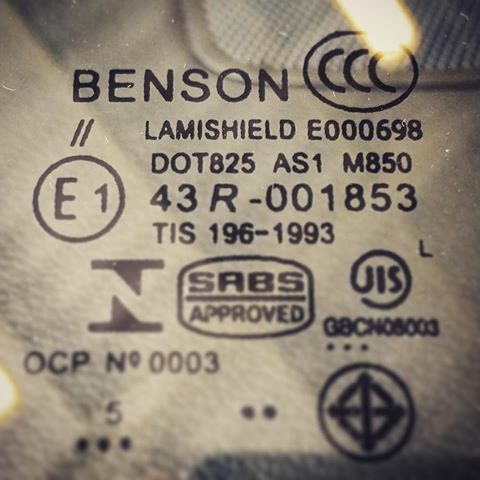 When a new vehicle is designed the vehicle maker can use an existing windscreen part from an older model, or they can create a completely new windscreen with its own unique part number. If the decision is made to create a new part, the vehicle manufacturer contracts and commissions a glass manufacturer to produce the part. These ‘authentic’ parts are installed when the vehicle is assembled. A percentage of that production run will be allocated to the vehicle manufacturer’s (usually franchised) main agents to be made available as replacement parts. OEM parts are – usually by far – the best available products. Is an OE Windscreen the Same as an AM Windscreen? After a new vehicle has reached dealerships and is sold to consumers, third party glass manufacturers will, sooner or later depending on any commercial or copyright restrictions, acquire and OE windscreen and reverse engineer a mould to manufacture their own aftermarket glass parts. OEE – or AM – parts are often slightly different in size; they have slight differences in the bend or curve of the glass and may also have higher distortion when viewed from an angle. All of these differences may range from negligible to discernible depending on the quality. As with most ‘copy’ or non genuine products, the more cheaper the windscreen (than the original) the more flaws you will find. Removal of the Manufacturer Logo. Some windscreen manufacturers (or even wholesalers) will remove the car manufacturer’s logo (from the windscreen) if that particular product is to be sold outside the main dealer networks (specifically by an aftermarket glass wholesaler). There may be some commercial restrictions for this in terms of authority to sell genuine parts, and some of these parts may even have been rejected by the car manufacturer. This could be down to a quality issue, or simply down to order fulfilment. What are some of the Main Differences Between OEM and OEE Windscreens? Clarity – Windscreens ‘bent’ during manufacture will show some distortion when viewed through at an angle. This can be described as waves or waviness. Aftermarket glass is pressed, moulded, fired (and cooled) during manufacturing in a slightly different way to the original. As a result of these differences the aftermarket process can create more distortion in the glass, especially on the curved parts of the glass. Often it is noticeably more. Safety – Both types of glass will be compliant as they go through the same ‘drop test’ if they are to meet the pass criteria. When both types meet certain safety guidelines, many installation companies will push the argument that aftermarket glass is ‘as good as’ or the same as the original version but the claim is based simply on this one similarity. Hardware – such as mirror brackets, ADAS camera and rain sensor mounts, radio antennae; heated windscreen elements; navigation modules and scuttle retainers. Aftermarket windscreen manufacturers use different materials for these ancillary and constituent parts. They’re often of a lesser quality and very obviously stuck on using less effective adhesives (sometimes double sided tape). The accuracy (in their placement on the glass) can often be someway off the correct axis. It is not uncommon to have to modify some of these parts to make mirrors and rain sensors fit properly, but with many cars featuring driver assistance devices (such as Adaptive Cruise Control and collision avoidance, read the full info here) the positioning of the mounting plates and brackets are vital. Silkprint – also known as the ‘obscuration band’ or frit. Some will have a dotted border, and others will be a defined line to border the glass edge enough to primarily help protect the adhesive from UV light, and also to cover the leading edge of the dashboard or conceal pillar trims. Genuine glass may have the logo of the car manufacturer incorporated into this (such as Jeep do on the Renegade model, for example). Aftermarket glass often will show misaligned VIN notches (the small area through which the vehicle’s chassis number is visible) or the dotted area around the mirror may show some imperfections. Which Windscreen Should I Choose? Ultimately, the decision is governed by price. This may not be the you – as the car owner’s decision; it may be driven by the deal struck between the insurer (or fleet operator) and the contracted repairer. What’s more important is how the glass is fitted. Who fits the glass and to what standard is just as important as the product fitted. There are some factors to consider in making that decision: the car. Is it a specialist car? Is it a car of high value? Is it a Marque of Distinction? Does the manufacturer warranty still cover the car? If you’re claiming for the damage via your insurer, what did you agree to before policy inception? If the car is your pride and joy, would you agree to have an inferior quality replacement part fitted? In my 25 years experience fitting windscreen and glass to cars – from everyday production cars to the more exotic and rare automobiles – the Original Equipment parts are the best available. They just fit better. The whole experience of fitting a genuine windscreen does not present any issues in that process, and there is never a call weeks or months down the line to report a mirror boss falling off for example. If an ‘equivalent’ does not bear the car manufacturer’s logo, it is usually nowhere near as one that does. This entry was posted in Uncategorized by Glasstec Paul. Bookmark the permalink.